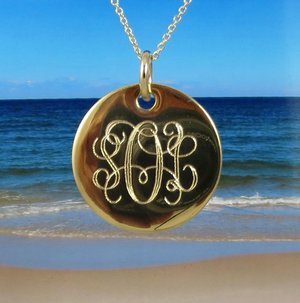 This gold monogram necklace, personalized and engraved is hand cut out of heavy 14k gold filled sheet and measures 7/8" in diameter. Gold filled means the gold is about 50,000-100,000 times thicker than gold plating. The front and back will not tarnish and the gold will not wear off. The interlocking personalized monogram engraved necklace has a great traditional look. Other fonts are available upon request. This necklace makes an excellent monogrammed Bridesmaids gift for your wedding, birthday gift or just something for yourself.